Application of coating requires careful process and techniques compared to conventional coatings. We often hold workshops and viewing sessions for coating professionals so you can master these techniques before introducing our products to your customers. 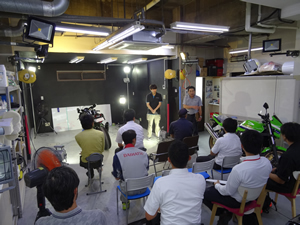 These workshops and viewing sessions are held in our technical training center in Kobe and mainly for those who are already using our products. If you are interested to introduce our products to your service menu, please feel free to contact us for training details. 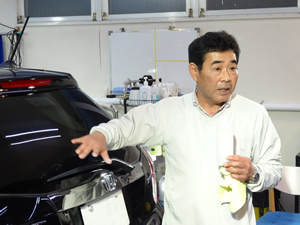 The abilities of a skilled craftsman used to be the only thing that matters in car detailing industry. However, the values towards cars are changing and new technical solutions are required to meet these diverse needs. We provide technical training programmes for polishing, coating, car washing and maintenance, and car coating shop operations. Our curriculum is a comprehensive package that even new users can understand the knowledge and techniques for coatings. *Depending on experience of the trainee, we may change training curriculum. As a car detailing store owner, you always want to keep up with the latest and best coating method solutions. You may need to learn application methods of other coating shops or collect test results, new information etc. However, you may not be able to invest time for this due to day-to day operations of your own shop. Our regular workshop will cover these needs. It is our job to investigate for you. We will share best practices of other shops and testing results with you through these sessions so you can improve productivity and quality of your work. It is indispensable to catch up with new technology and brush up on your technique to provide best services. We do not just sell material and say good bye, but we make sure to backup our customers. Director of Quartz Technica. 30 years experience in coating and painting industry. When glass-coating was in a development stage, he played an important role in the quartz glass coating development. He continues to conduct data analysis and daily vehicle testing in order to provide users with a coating that produce excellent and even better antifouling effect. He provides comprehensive technical training and transfers the skills of shop operations and philosophy through his workshops.